The first Zero Waste Research Center in Europe was founded in Capannori, Italy, in December 2010. The research center is a vital piece of a Zero Waste strategy because it is impossible to slim the waste bin if we don’t know what ends up thrown in it. In order to get to Zero Waste, waste needs to be made very visible so that we can develop actions to prevent waste from ending up there. The traditional systems of waste management are designed to hide waste. The claim that landfills and incinerators make waste disappear it’s nothing else but a myth. As Professor Paul Connett says: landfills bury the evidence and incinerators burn it (i.e. bury them in the atmosphere and in toxic ashes). If we want to act against waste, we have to make it very visible. This is why the Zero Waste Research Center was created; to study what is left in the residual fraction of the household and commercial waste. 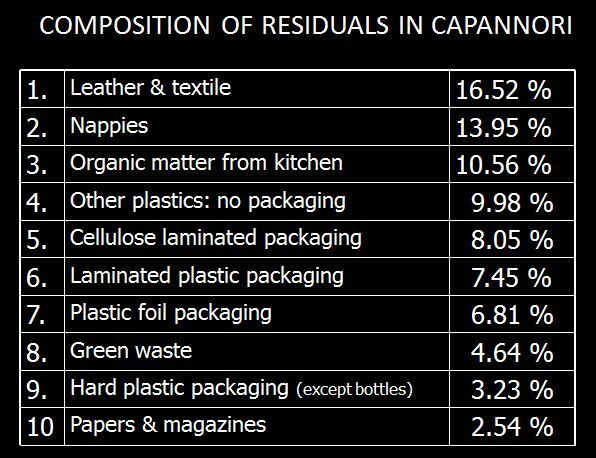 Capannori, like many other italian municipalities where the door-to-door collection systems are applied is above 75% separate collection. Therefore it is time to look into what is left in the remaining 25% in order to advance towards Zero Waste. As we can see 85% of what is found in the residual fraction can be prevented, composted or recycled. 28% of it are plastics, 22% is biodegradable, 16% is clothing and 13% nappies. This means that if the right policies are in place the total household and commercial waste that should be sent to disposal would be less than 5% of the total waste generated! The ZW Research Center is composed of an operative team with industrial designers charged with the task of proposing changes to the design of badly designed products. These proposals are then sent to the producers responsible for the manufacture of toxic and/or non-recyclable and/or non-biodegradable in order to give them sustainable alternatives. The Center also has an Scientific Committee composed of waste experts, university professors and other technical people who can provide useful advice. Albeit its very limited resources the Zero Waste Research Center is setting an example to follow for any municipality who wants to advance towards Zero Waste. If we want to act against waste, we have to make it very visible.